We had 45 members and two guests attend the July General Meeting. Remember, keep bringing those guests, as you'll be entered in a raffle at the end of the year! In place of the name tag tax, we now have a raffle at each meeting. Everyone wearing a name tag is entered to win. Patty Rice won in July. Congrats, Patty! Thanks, Charlotte, for leading this up. Kate updated us on the Library Project. 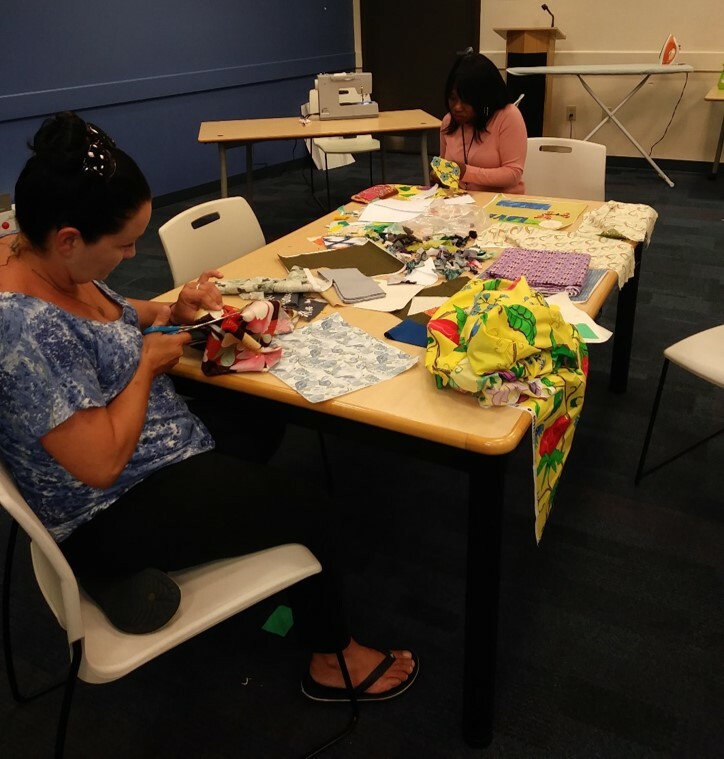 Over the past few months, she and other SFMQG members have been teaching beginning sewing classes to people of all ages at the public library. If you're interested in getting involved, there are upcoming sessions on July 29th and August 24th at 10:00am. Please reach out to Kate at kate@southfloridamqg.com if you would like to get involved. Special Topic: Scraps, Scraps, Scraps! The special topic for July was scraps. We had a active discussion on scrap storage, what works (sorting by color into separate bins, cutting preset sizes) and what doesn't (shoving everything in a small drawer). 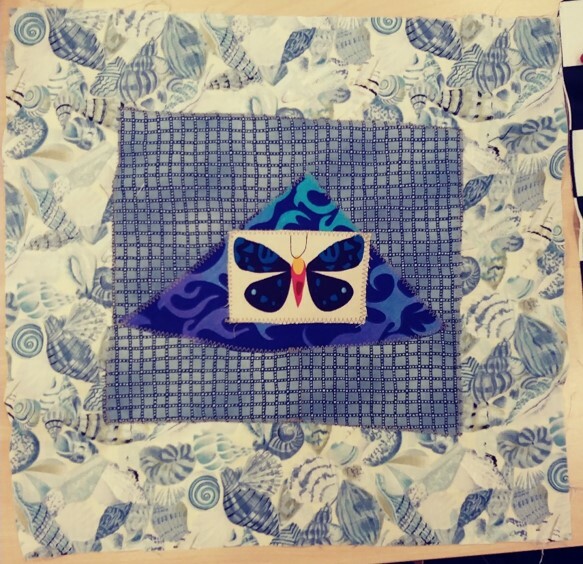 SFMQG members then shared some of their favorite scrap quilts. We also did a scrap swap. Any one who wanted brought in a small bag of scraps. At the end of the meeting, everyone that brought in a bag got someone else's to take home and incorporate in a project. I can't wait to see what everyone created with the scraps they received. This meeting marked the conclusion of our 2017 Quilt Along. 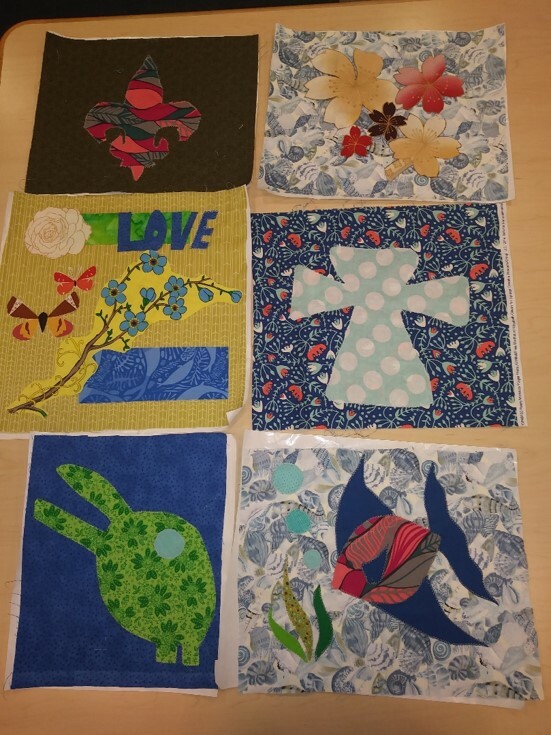 Debbie K. led us on quite the journey this year - a new skill was covered each month (half-square triangles, strips & squares, flying geese, quilt construction). Participants made sample borders pieces along the way, thinking about an end project the whole time. This made the reveal especially fun, as the quilts were relatively secret. Every quilt was designed by the person who made it and this made for a wide variety of unique and fun projects. A big thanks to Jen from Red Threads who sponsored this event, with monthly raffle prizes for participants and a large raffle prize at the finale. Congrats to Diane for winning this! Remember, for the next month, use the code SFMQGQAL at checkout and receive 15% off any purchase from Red Thread Studio. You can find the final post for the QAL here and the gallery from the reveal here. Thanks again, Debbie & Jen, and thanks everyone for your participation. This month was a raffle basket drawing. There were some wonderful prizes in the basket. Congrats to Diane Moss for winning and thanks to Alyson for continuing to organize this. Congrats to Kerrilyn on winning the June BOM. I can't wait to see what you make with those adorable birdies. The July BOM has been posted on the blog. You can find it here. Don't forget, Latifah Saafir is quickly approaching! You can read more info here, in the blog post. Don't forget to register for the lecture and workshop(s) you're planning on attending. Reach out to Andrea at events@southfloridamqg.com if you have any questions. Kerrilyn and Debby presented a swap, to be exchanged at the September general meeting. You can read all about it here, on the blog post. More pictures from the meeting can be found in the gallery, here. I hope everyone has a good July, with lots of time for sewing. Looking forward to seeing you again, whether at an upcoming general meeting or the Latifah Saafir events.